I was going to do a review of Podcamp Ireland 2008 which was held yesterday in Kilkenny. It’s Sunday evening now and there are already a couple of very good reviews completed by Keith Shirley and John Keyes. I’ve decided I couldn’t do a better job than the two guys, so I’m not doing mine now. I will say however that this was one of the most engaging conferences I have ever attended. The atmosphere was very relaxed but more than that there was a real focus on sharing. It was all about conversation; talking to each other about our individual experiences and listening to each other to learn what we could. A huge amount was crammed into a short day and I will pick off topics over the coming weeks to share here. I met so many new people that I am a bit overwhelmed today to put it all in perspective – will hopefully touch base with many of them via social media in the next while. On a personal note I enjoyed what I thought was a decent discussion (photo here) with Minister John McGuinness and Gabriela Avram on how business and government can make greater use of social media. This particular conversation was sprung on all three of us at short notice – thanks Bernie – but I think it worked okay. A key focus for me was that both the existing community online and business/government have a part to play if meaningful engagement is going to happen. Business/government will only continue to engage if their overtures are not roundly shouted down by over-the-top cynicism and rebuke. Thanks to Bernie, Krishna and Ken for organising an extremely professional un-conference. A special mention goes to MadeMarian for the lovely badges (given to me by Grannymar) she made for people who were speaking yesterday – I was really chuffed to get one. 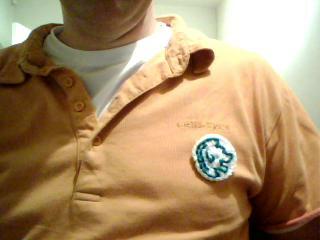 I’m wearing my first social media badge proudly today. It was great meeting you yesterday and joining the conversation. Hi Gabriela. Mortified, but have fixed that now. Thanks for pointing it out to me. I didn’t actually see MadeMarian knitting yesterday but it is wonderful that she was.